Hunters Choice offers 20+yrs Technical Service & Set Up! Only the Best Works on Your Bow! 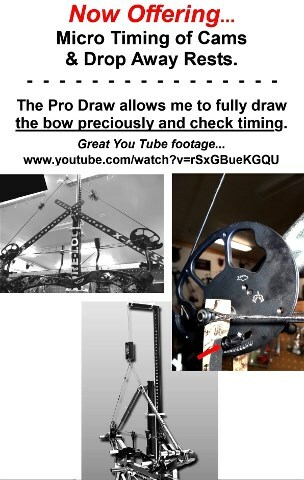 We offer full range of complete technical services such as Paper Tuning, Timing, & setting Mathews Bows to Factory Spec. All contribute to optimize overall performance and straight arrow flight. All Bows purchased at Hunters Choice receive Set Up Included. We Service & Set Up All New Bows Purchased at our Shop. Customers who purchase their new Bow from Hunters Choice receive future Service & Labor Discounted or Free depending on the Service Needed or Time Required. Labor & Service Charges will apply to all New Bows NOT Purchased at Hunters Choice. Labor & Service Charges will vary depending on amount of Labor & Time involved. Hunters Choice Offers Package Pricing on all New Bow & Accessory purchases. All Packages are subject to variations and can be customized to your specific wants or needs. Pricing may vary depending on the substitutions made. Layaway Payment Programs are offered on all new bow purchases. A minimum down payment is required, and monthly installment amounts will apply. In stock bows will be pulled and set aside with a 25% downpayment. Ordered Bows will not be ordered until at least 50% or more of the bow has been paid off. No Bow will be set up until full payment is received for the Bow & Installed Accessories. ALL Bows remain at Hunters Choice until Full Payment has been received. Hunters Choice Services any Bow Line. We Service & Set Up any Used Bows at our Shop. Labor Charges will apply & vary depending on if the Bow was or was not originaly purchaced at Hunters Choice. Labor Charges will apply & vary depending on the Service & Time Required. Looking at a Used Bow? Bring it in, We will give you an honest opinion on the Condition of the Bow and if it can be Set Up for your specific draw & shooting needs. Looking to Sell a Used Bow? Bring it in, We will give you an honest opinion on the Condition and what it possibly worth. Want a New Bow, but have an old bow to sell? We do offer a Consignment Program. Call us for Specifics, Details, & Requirements. Hunters Choice may consider taking your used bow in on trade, credit only towards a new bow or crossbow purchase. Correct Arrow Flight is Key to Accuracy. Shooting through paper is proven effective. We offer several Fall Away Rest Options & Installation. We provide Helical Flethcing for Fall Away Rests, providing Optimal Spin. Straight Fletching is available for all non fall away rests. We provide String Installation on all new & used bows. Due to the variations in the bows today, we may or may not have the string size/length in stock. We custom order stings asap and can usually get them in with in a short time. Strings are installed as soon as we get them, and bows are usually complete with in a 1-2 day time frame. We offer various maintenance packages, we will customize packages to fit your specific needs. Our Indoor Range offers a great enviornment to learn & practice. Both Bill & Karen (owners of Hunters Choice) are accomplished archers, and provide one on one shooting instructions. * See Range Tab for More Info * We have the areas largest indoor range. Infloor radiant heat. Warm up lane is open at all times. We have Bag & 3D Targets, up to 30 yds. Got a Questions about Services & Set Up?